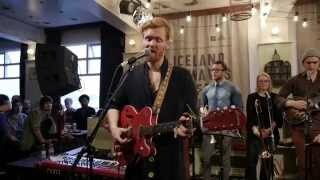 Icelandic folk artist Junius Meyvant heads to Deaf Institute next February! Born and raised on the Westman Islands off the south coast of Iceland, Unnar Gísli Sigurmundsson has been releasing music under the moniker of Júníus Meyvant since 2014. Unnar was brought up in a musical and religious household in Heimaey (the largest island of the volcanic archipelago skirting the south coast of Iceland) and the island’s microscopic population (a mere four thousand people) and wild & rugged na-ture was a great playground for him to thrive. As a young boy he spent most of his time skateboarding, painting, and thinking about playing an instrument but never quite getting around to it. It wasn’t until his early twen-ties that Unnar stumbled upon a beaten-up guitar at his parents’ house and in playing this he managed to tame his inner beast. His sense for songs and melodies burst like rockets, the uncontrollable urge for writing music and a constant flow of ideas kept him tossing and turning every night and day. Initially filtering his ideas through a band, Un-nar decided to undertake his alter ego of Júníus Meyvant and embark on his musical project as a solo endeavour. Drawing comparisons to the likes of Sam Cooke, Charles Bradley, The Rolling Stones and Devendra Banhart, Júníus Meyvant’s afflicted, concise, melodic and rich take on freaky folk pop has a highly familiar and soulful feel to it and a hint of attitude. The wide sound pallet is all embracing and made up with Unnar’s sultry voice, sizzling guitars, pummelling rhythms topped with washes of horns, synths and mellotron. His debut single, ’Color Decay’, garnered much praise across Iceland and from inter-national publications such as KEXP and NPR upon its release in 2014. The year fol-lowing, Júníus went on to receive ‘Best Single’ and ‘Newcomer of the Year’ at the Ice-landic Music Awards, marking him as a important new talent amidst the Icelandic music scene. After successful tours in Europe and the US, Júníus released his debut full length, ‘Floating Harmonies’ in 2016. His sophomore album, ‘Across the Borders’, is set for release on Record Records in 2018. The eleven-tracks were recorded with mu-sician & engineer Guðmundur Kristinn Jónsson (Erlend Oye, Ásgeir, Hjálmar) in Hljóðriti Studio on the outskirts of Reykjavik.